Do you want to text your friends and love ones without worrying interconnection text charges? 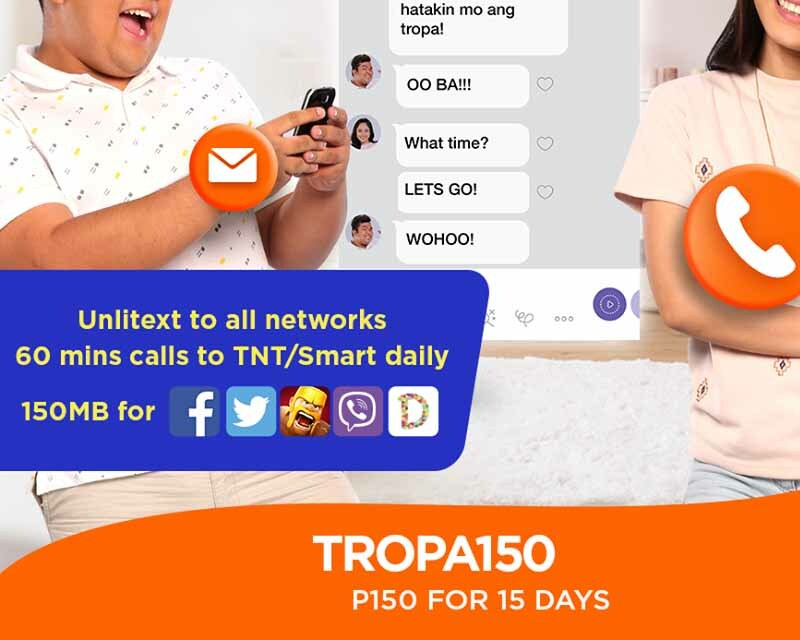 With Talk N Text Tropaload TROPA150, you can enjoy unlimited text to all networks for only 150 pesos that is valid up to 15 days. Aside from that, you can also browse on Facebook, Twitter, Viber, COC, Dubsmash plus 60 minutes of call to Smart and TNT daily. This promo only gives 100MB data per day that you can use on the mentioned babad apps and 60 minutes of calls every day that refreshes every 12-midnight. Subscribing to Talk N Text TROPA150 can be done via SMS keyword, all you need is a regular load balance of 150 pesos before you text the promo registration format. 150MB for Facebook, Twitter, COC, Viber, and Dubsmash per day. If you want to subscribe to this promo for one month with one-time registration, just use the TROPA 300 – valid for 30 Days. Wait for the SMS confirmation from Talk N Text before you start using this promo. If there’s a delay on receiving the notification, you can always check by doing TNT Balance Inquiry if your regular load. Please maintain P1.00 to continue using the promo until it expires.